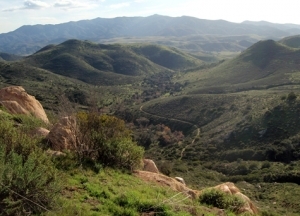 February 10, 2011 (Jamul) -- Last summer I visited Hollenbeck Canyon for the first time, and was impressed by its unusual character. Since then, I’ve returned to enjoy the attractions in other seasons. This is not a typical coastal sage brush canyon at all, but shaded by massive coast live oaks and California sycamores with a seasonal creek running intermittently through the canyon bottom. 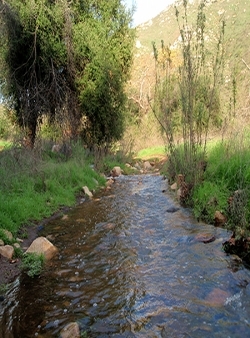 Hollenbeck Canyon is a State of California Wildlife Area, designated in 2001. It’s administered by the Department of Fish and Game. The trailhead and parking are located near the junction of old Highway 94 and Honey Springs Road ,about five miles east of Jamul and northeast of Lower Otay Lake. Access the trailhead via Honey Springs Road near the junction of State Hwy 94 (Campo Road). The parking lot is on the left almost as soon as you make the turn. There is not too much in the way of facilities, but there are portable toilets, though maintenance looks infrequent. Being Jamul, certain times to visit will be better than others. It gets pretty hot out there on a summer hike. There are bird-hunting seasons open in the fall months. The season will also dictate wildflower and bird life. There was quite a variety of small birds throughout the canyon, as well as the larger crows, ravens and hawks soaring high on my summertime hike. Retuning one fall morning, I came across a small gopher snake warming itself on the trail. Coyote and mule deer “signs” are common along the trails. 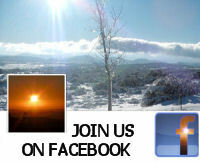 Winter is a great time to see Hollenbeck Canyon. This year, La Niña's rains turned the dry, dusty creek bottom to a wide, swollen creek. Though this tributary doesn't seem to have a name, I have seen water running, at least intermittently, on some occasions though on others it's been a dry wash. There is enough water to support a population of swamp crayfish, and a few different types of salamanders. Judging from some topographic maps I've seen, there is a possibility the creek is partially spring-fed. The hillsides green up considerably in the winter and the chance of encountering rattlesnakes is diminished. Leaving the parking lot and hiking up the trail, through a yellow, grassy field doesn't hint at the experience one finds once cresting the rise to see broad oaks and sycamore. The wide main trail includes three spots which in wet months can become pesky water crossings. If it has been wet, and you come to a water crossing, look to your right (east), for a small trail. This trail will take you along a hillside and past two of the other water crossings. The third crossing is unavoidable; there are some stones to hop across (I find trekking poles very handy for water crossings). If it's not wet, continue east, up the canyon on the fire road. After strolling beneath the large trees, you will eventually be presented with a clear fork. The left option is the fire road you've been walking on, heading obviously uphill. The route I recommend is the right fork, which is a narrow, rolling single track rising gradually over a deep, beautiful canyon. Take note of the stone retaining walls which make this trail viable. In wet months, the sound of waterfalls in the canyon below is unmistakable. Also note Lyons Peak to the southeast. Hike far enough on this trail and you will come to another fire road turning sharply left. Follow it and you will climb a short, steep hill to a saddle, and junction. This will be the main fire road, from which you split earlier. From this saddle you should be able to see nearly the entire main canyon, including the route back towards the trailhead. On the way down, you may see a small, but obvious, trail angle off of the right side of the road. This little single-track trail contours the hillside, ending up the same place as the fire road you are on. It is a little nicer option to a fire-road march, giving you a look at the variety of plant life on your way down the trail. At the bottom of the trail, near where it meets back up with the fire road, you will see the remains of a brick fireplace, and the outline of a small cabin floor. Hop on the fire road and head back west to the trailhead. Hollenbeck Canyon is a terrific place to spend a day hiking. Being DFG land, dogs are welcome. 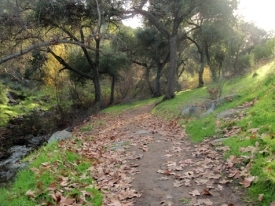 Hollenbeck is great for birders, hikers, joggers, and geocachers. 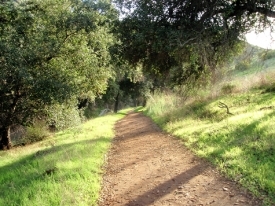 Give it a try—the preserve is a recent gift to San Diego's outdoor enthusiasts. Yes, Hollenbeck is mountain bike friendly. I forgot to mention, Hollenbeck Canyon is equestrian-friendly as well.